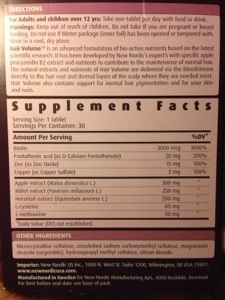 Soooooo I’ve been toying with the idea of taking hair vitamins for a few months now. I recently discovered that after all of these years of having adult acne, it was my multivitamin that was causing my breakouts. A few weeks ago, I started taking vitamins again and my face started to break out AGAIN! So I stopped immediately. 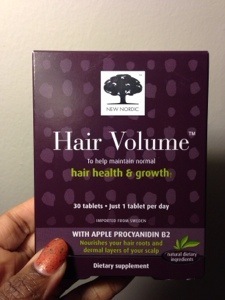 I spoke with my friend and she’s tried several hair vitamins as has had ridiculous amounts of growth, so I was intrigued. I tried to resist because I’d rather clear skin over longer hair, but today I found myself walking into GNC. I was going to get the Hair Nourish vitamins that she recommended and that I see a lot of people have success with, but the lady in the store said she found Hair Volume to be better. I was sold. Let’s corporately pray for my skin because I’m diving IN! I’ll be increasing my water intake significantly and hopefully this will counteract whatever effects the vitamins generally have on my skin since I have no clue exactly what causes the breakouts. This particular one seemed like a good option because it has less ingredients. I’ll begin in the morning. Any luck with those vitamins and have you tried Hairfinity? The vitamins were great. I’m pretty sure my hair grew a lot although I haven’t actually done a length check or anything. They did make my face break out, so I had to stop them. I’ll do a full post shortly. Ok, thank you for your response. Another question have you posted about your hair care products and daily/nightly care routines? Whats the verdict on the vitamins?